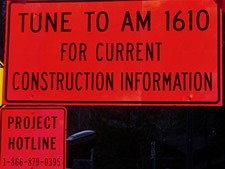 Work zone public information and outreach can occur at both the program-level and the project-level. Both are important to enhancing safety and mobility in work zones. The Work Zone Public Information and Outreach Strategies Guide (HTML, PDF 3.4MB) provides tips, examples, and practices on designing a public information and outreach campaign for work zones and offers a variety of strategies that can be used in a campaign. Program-Level Public Information and Outreach Examples - Program-level strategies are used to raise general awareness about motorist and worker safety and mobility issues and the need to be vigilant while driving in work zones, and are not geared toward a specific project. Project-Level Public Information and Outreach Examples - Project-level strategies are used to communicate with road users, the general public, area residences and businesses, and appropriate public entities about a specific road construction project and its implications for safety and mobility in the area. Each year in April, National Work Zone Awareness Week (NWZAW) is held to bring national attention to motorist and worker safety and mobility issues in work zones. Since 1999, FHWA has worked with the American Association of State Highway and Transportation Officials (AASHTO) and the American Traffic Safety Services Association (ATSSA) to coordinate and sponsor the event. Over the years, other transportation partners have joined the effort to support NWZAW. In addition to a National event conducted each year, many States host their own NWZAW events. The work zone focus state initiative was developed to help improve highway safety and mobility through a targeted focus on work zone public information and outreach. Six focus States participated in the initiative, which was comprised of two elements: 1) an FHWA-sponsored workshop held to discuss work zone public information and outreach; and 2) technical support to assist the focus States with implementing enhanced public information and outreach for their work zone projects. To view PDF files, you need the Adobe Acrobat Reader. To view PPT files, you need the Microsoft PowerPoint Viewer. To view DOC files, you need the Microsoft Word Viewer.